The Oculus Keratograph Topographer provides an in-depth qualitative and quantitative analysis of the tear film on the corneal surface. In addition, the Meibomian glands of the upper and lower lids can be imaged 3-dimensionally. These glands secrete oil which covers the tear film, helping to prevent evaporation. 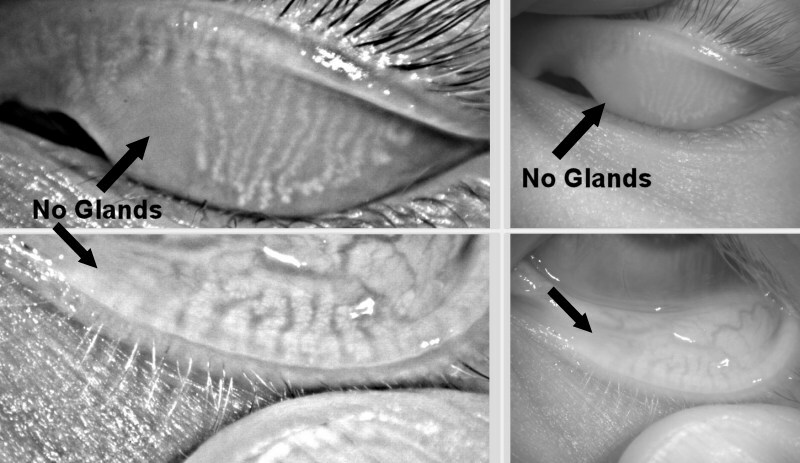 If these glands are absent in the upper or lower lids, parts of the tear film may not be adequately covered, resulting in evaporation and decreased tear break up times. See the image at bottom. In the image below, the patient is instructed to blink several times, then keep the eye open as long as possible. The Oculus constantly analyzes the tear film, and records tear break up times by region as shown in the diagram on the right. Lasik patients generally have reduced tear break up times, indicating neuropathic damage. Think LASIK doesn't cause dry eye. Check out the article "Role of Corneal innervation in LASIK Induced Neuropathic Dry Eye" here. While rates of post-LASIK dry eye are frightening, the history of the complication is even more scary: Dry eye was never considered as an adverse event in the FDA clinical trials. It was only considered a side-effect. Otherwise, LASIK would never have met the 1% adverse event rate required for approval. In fact, patients in the original clinical trials were not studied beyond six months. As a result, dry eye plays only a limited role in the informed consent process. Most LASIK candidates never learn that patients can be depressed or suicidal due to dry eye alone. Medical device reports to the FDA are saturated by severe dry eye, further pointing to the severity of this complication. 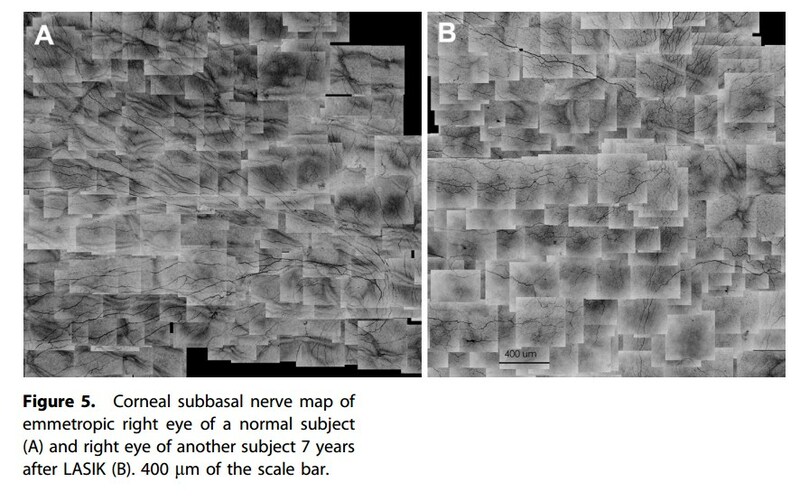 "An example of the differences in corneal nerve architecture between eyes that have undergone LASIK and normal eyes is seen in Figure 5, which shows corneal nerve maps of a normal non-dry eye subject who did not undergo LASIK (Figure 5A) and a similar region of the cornea in an age-matched subject who had undergone LASIK 7 years earlier (Figure 5B). The corneal nerve architecture in the LASIK eye is clearly different from the normal cornea, except for the nerves in superior cornea, which corresponds to the hinge region of the flap. In addition, the width of the nerves in the LASIK eye is thinner than normal even after 7 years, which is consistent with previous findings. Patient Advocate Dean Kantis of LifeAfterLasik.com) has created a number of informative videos about the LASIK industry.